Inkjet disc printing is the easiest way to produce professional full colour high resolution prints. Now thanks to the StorDigital DP series automated CD & DVD disc printers and Taiyo Yuden it is possible to print high resolution, glossy and water resistant discs with ease. 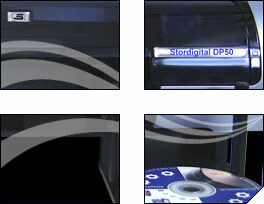 StorDigital inkjet disc printers are available in both 50 and 100 disc capacities. Whatsmore the DP50 and DP100 inkjet disc printers are based on Hewlett Packard printing technology, ensuring printing to the highest possible standard with inks and consumables at a price you can afford. Get fast, hi resolution, rich colour, glossy waterproof inkjet discs with Stordigital DP50. Get fast, ultra resistant, thermal printing with Stordigital Uprint. Produce 1000s of discs with StorDigital Automated Printers. Find more about StorDigital networkable printers.